In 2011 our mother company, Form Designs Australia, duly responded to the West Australian Government’s requests for Shark Mitigation Strategies. With its decades of experience in Industrial Design they began researching only sustainable approaches and after contemplating other possible methodologies, finally ended up developing and pioneering a Shark Barrier Technology - swimming enclosures as we know it today. The prime focus was to develop an outcome that would preserve human and marine life while limiting the effect that the technology would have on the environment. Researchers at Form Designs established that the most effective shark mitigation strategy possible was a physical barrier; an eco-friendly enclosure that would separate large predators from ocean users without harm. Shark Barriers would have to be robust, ridged structures that formed a complete divide between the open sea and swimming area, from seabed to surface, in contrast to “shark nets” which are flimsy, unforgiving, loose hanging structures that unfortunately indiscriminately trap and kill unsuspecting marine wildlife of all kinds. Never losing sight of the fact that sustainability and preserving life and environment was the main criteria; the industrial design team started the design process to establish concepts, even considering recycled car tyres as a possible sustainable material. Designing for the ocean is a huge task and requires contributions from a number of professions, including marine engineers, material specialists, marine scientists and shark experts to contribute to its realisation, which truthfully is still a relatively new field. The “Syntactic Structure” (Bonollo, 2018), the architecture of the Aquarius Barrier was developed in collaboration with experts in the field, choosing key structural elements with critical dimensions and load requirements that had to be carefully calculated. The key dimension, the unit of modularity had to be established first. This question was posed to the experts in the field, who we discovered were based at the Australian Maritime College in the Department of Maritime Engineering & Hydrodynamics at the University of Tasmania. The study was conducted under the guidance of (Associate Lecturer) David Harte and (Thesis Writer) Todd O’Brien who’s calculations not only established that 360mm squared was the most suitable dimension for the apertures but that an 11% surface area of vertical cover was the most appropriate in consideration of Tidal and Wave Interaction, Parallel Wave Interaction, Barrier Layout and Flow Angles in relation to drag coefficient. 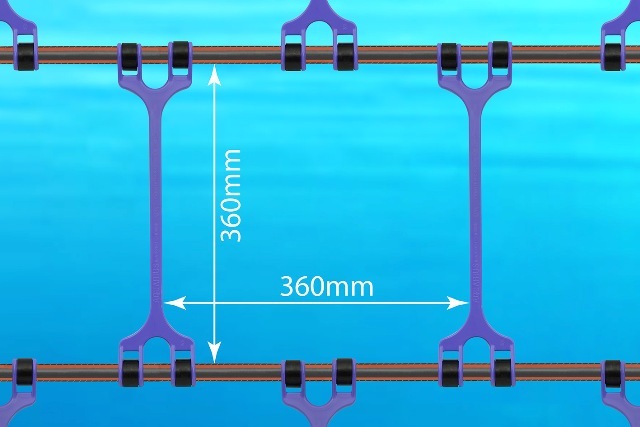 After establishing the science behind the modularity, we had to gain expert knowledge about shark and other marine wildlife behaviour that would encounter enclosures, to ascertain whether these dimensions were appropriate. Our collaborations with the W.A. Department of Parks and Wildlife (Doug Coughran, Senior Wildlife Officer) established that the proposed Aperture Dimensions, the Syntactic Structure, Float design and other design criteria was compliant with Australian Standards and that ideally the apertures should be as large as possible so as to allow other marine creatures including Seals and Dolphins to move freely through the barrier, while not allowing certain Shark species greater than 2.4m to gain access to the enclosure. Based on this information, designers were directed to use the 360mm squared aperture dimension as the unit of modularity and proceeded to engineer the Aquarius Barrier. While engineering a product as complex as a Shark Barrier that had to comply with the Australian Standards for Playground Equipment the “Use Function” (Bonollo, 2018) was a priority. M.P. Rogers our Marine engineers were briefed to establish the strength criteria and specification for the anchoring system which had to be calculated based on the data provided by the University of Tasmania. The goal was to achieve a combined 8 ton vertical breaking strain and a 169 ton horizontal breaking strain respectively to deal with a 1 in 25 year storm event. Another major consideration was the volatility of the ocean as everything in and around it is constantly moving, the only disparity is the amount of movement at any given time. What further exacerbates this problem is that nothing remains in its place, the environment experiences constant transformation, so designing a structure for the most volatile environment on earth - the surf - is truly challenging. 1. Provides the appropriate dimension for most marine fauna that encounters the barrier to get through, especially Porpoises or smaller Dolphins and Seals. 2. Shark dimensions are difficult to obtain other than their lengths and weights, however it was established that an aperture of 360mm square would be too small for a shark with a body length of around 1.2 to 1.4 metres (depending on the species) to access - Wobbegong excluded. 3. Sharks have a triangulate front profile with the dorsal and the 2 side fins extending beyond the golden 360mm square aperture, preventing even small sharks from entering. 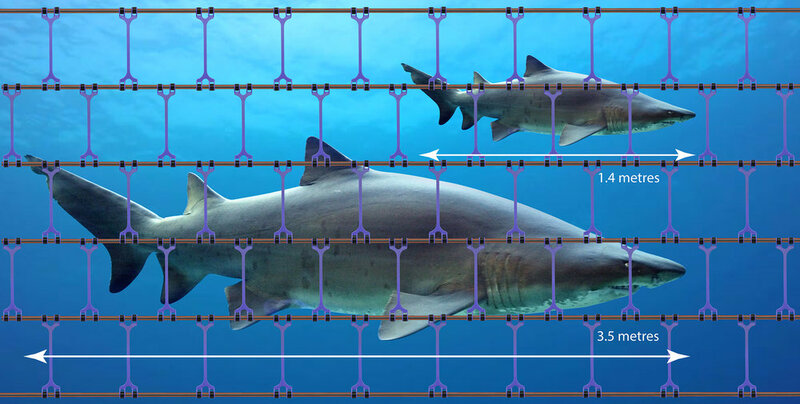 After years of research and development, trials and tests, failures and successes, Global Marine Enclosures have reached a milestone in Shark Barrier Technology. Latest results have shown overwhelming improvements in performance and reliability. The “Use Function” (Bonollo, 2018) of the Aquarius GEN 2 Barrier is seamless in its intended environment; the architecture of the Barrier is robust and modular while the latest materials utilised are extremely durable, making the Aquarius GEN 2 Barrier the most advanced Shark Barrier in Australia and possibly the world. Bonollo, E. (2018). Product Design: A Course in First Principles. In ePub (1st ed., p. 13). Upfront Publishing UK. Shark Image Credits to: Elias Levy, Albert Kok, Amanda 44, Adobe Stock & Shutterstock.